For my family, Christmas always means a lot of cookies. I started this tradition, 11 years ago, when my husband and I got married. In my small apartment kitchen, I churned out 3-4 different cookies and gave them out to co workers, friends and our doormen, since we couldn't afford to tip them at the time. 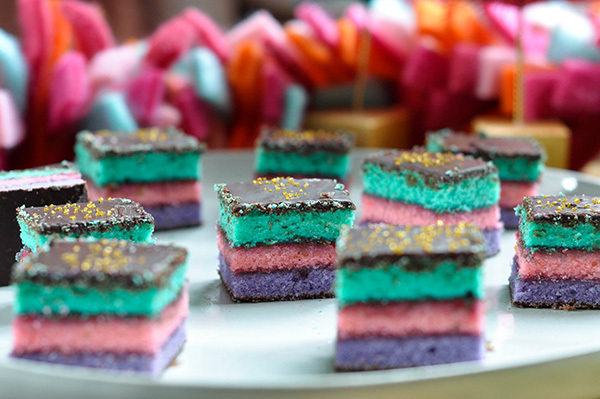 And these rainbow cookies always made the list. I originally made these because they are my husbands favorite cookie. We couldn't walk into an Italian bakery without him buying a couple. So when I found this this cookbook with the recipe, "Christmas Cookies from the Whimsical Bakehouse", I had to try it. I make them every year with my tiny modifications, so this is truly a tried and true recipe! 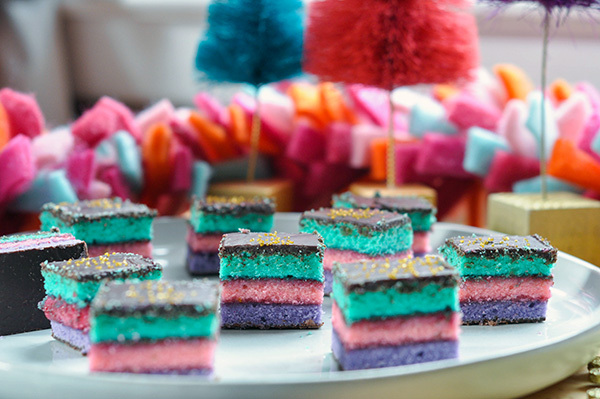 But this year, I thought I'd put a spin on the traditional idea of Christmas colors, and make them Unicorn Rainbow Cookies! These are a huge hit with the kids. Who can resist a pink, purple and teal cookie? They're soft, packed with almond,raspberry, chocolate and actually get better the longer they stay in the fridge- so they're the perfect make ahead cookie! My husband actually prefers not to eat them fresh and waits a day or two before digging in. Sounds weird but its true. Now, with that being said they do take 2 days to make. And it's a bit labor intensive. But depending on how big you want to cut them, you get dozens and dozens of cookies. So you'll have plenty to send around! They start with making the cake. Not sure whether to call these cake of cookies, but it's essentially 3 thin sheet cakes layered on top of each other. The cake starts by beating sugar, almond paste and one egg. Then comes 1 lb of butter. Don't freak out, it makes a TON of cookies! The baking powder, milk powder and corn syrup. Then 8 eggs. The original recipe says 7-8 eggs, but I always put in 8. Once mixed, slowly mix in the cake flour and water. This will make a lot of batter, so make sure you use a large mixing bowl! Then divide this batter into 3 separate bowls and add your food coloring. I used Wilton's Rose, Teal and Violet gel coloring. Add a pinch at a time and whisk it in one by one. I find that gel food coloring gives the cake a more vibrant color than the liquid. I used liquid for years and every year my husband said they weren't bright enough. Then I discovered gel and it totally changed the game! 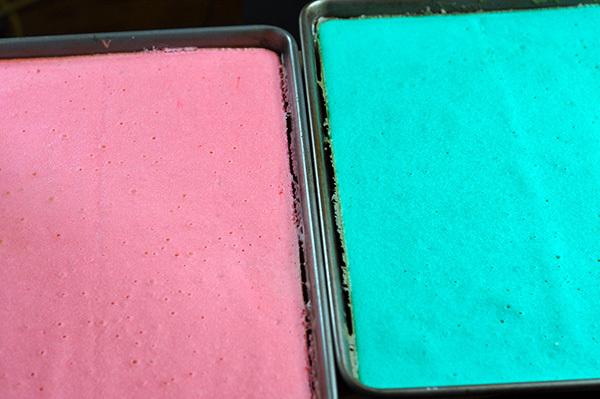 Spread each of the colored batters into the prepared sheet pans and bake for 15-18 minutes. Allow to cool then spread the jam onto the purple layer (or whichever color you want to be on the bottom of your cookie) Then carefully flip the pink cake (your middle layer) onto the purple. I always find this easier to do with two sets of hands. It's ok if it falls apart, place the pieces on top and once it's done and cut, no one will ever know! Spread the rest of the jam on the pink layer and then flip the teal layer over it. Wrap this in plastic, place the sheet pan on top and weigh it down with whatever you have. I used can goods. Then place it in the fridge overnight. Once chilled, melt your chocolate over a double boiler, stirring occasionally to prevent it from burning. Take the cake out of the fridge and flip it over so that the purple side is facing up. remove the pan and the parchment paper and pour 1/2 the melted chocolate over the top and quickly spread it evenly. Let this set in the fridge for 10 minutes then flip and repeat on the otherwise. Once the second side has set, measure and cut into squares or rectangles. These cookies are so pretty and so yummy, they'll be devoured in no time! *adapted slightly from "Christmas Cookies from the Whimsical Bakehouse"
Preheat the oven to 350F. Grease 3 jelly roll pans and line with parchment paper. Set Aside. Using a stand mixer fitted with a paddle attachment, Beat together the sugar, almond paste, and one egg. Add the almond extract and mix. Add and cream the butter, baking powder, milk powder and corn syrup until light and fluffy. 3- 5 minutes. Beat in the 8 eggs, one at a time. With the mixer on low speed, add in the cake flour about 1 cup at a time. Once combined, mix in the water. Divide the batter into 3 large bowls. Add in a small amount of the pink, teal, and violet food coloring into each individual bowl. Whisk to incorporate, washing the whisk before mixing the next color. Pour the colored batter into each of the prepared jelly roll pans and spread evenly. I used an offset spatula to help make this job easier. Bake for 15-18 minutes. I usually bake for 15 minutes. The edges of the cake will be lightly browned but the center will be soft and springy. Allow to cool before proceeding. Loosen the cakes from the pans by running a pairing knife along the edges. Spread 1/3 cup of jam on the purple layer. Carefully flip the pink cake on top of the purple cake. Peel off the parchment from the pink layer and spread the other 1/3 cup of jam on top. Then carefully flip the teal layer on top of the pink. Turn the pan over from the teal layer, and place it on top. Wrap this in plastic wrap, place weights on top (I use whatever can goods I can find) and place in the refrigerator to chill overnight. Take the cake out of the refrigerator and flip it over to the purple side. Take the pan off and gently peel the parchment off. Pour and quickly spread the melted chocolate over the top of the purple layer. Spread using an offset spatula to ensure an even coat. Place in the refrigerator to set and harden for about 10 minutes. Keep the chocolate over the simmering water to prevent it from cooling. Once chilled, flip the cake over to the other side and pour the rest of the chocolate over the teal layer. Quickly spread it evenly over the cake. Place in the refrigerator for another 10 minutes. Cut into bite sized pieces. I cut mine into 1X 1.5" rectangles. These can be stored in an air tight container in the refrigerator for up to a week.